Lahore International Airport is now weather proofed. During an intense but short project that lasted only 12 months, the airport’s nominal capacity has been upgraded to handle 29 aircraft movements per hour, regardless of weather. ADB SAFEGATE worked closely together with the airport and Pakistan’s Civil Aviation authorities to increase airport performance and upgrade capacity to beat the challenging foggy winter climate. With a complete integrated system in operation, from the runway up to the tower, Lahore is now reaping benefits of increased capacity and is also able to accommodate diversions from neighboring airports. In June this year Safegate Group and Lahore Allama Iqbal International Airport signed a contract to work together towards weather proofing the airport in only 12 months. The objective is being able to land aircraft in low visibility before the winter, and by May 2016 to handle 25 movements per hour. A project as complex as this can easily take 5 years to implement. To to do it in only 12 months’ time is unheard of. Until now! We spoke with Jesper Svensson, General Manager SafePerformance for Safegate Group about how this is possible. 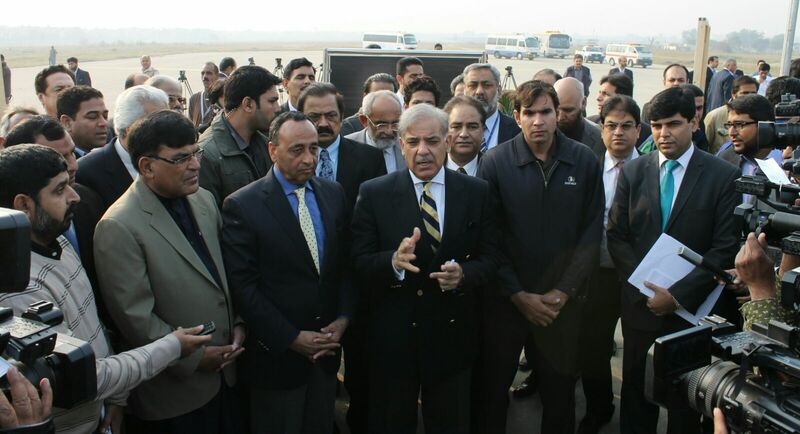 Punjab Chief Minister Shehbaz Sharif inspected and inaugurated the latest landing system installed on the runway that will enables flights landing at even 50 metre visibility. The first step of the airport expansion project has been completed in a record period of time and would not only ensure safe landing of planes in foggy weather and low visibility but also help save time for the airport, airlines and passengers.